As our friend Eduardo came in this morning, his eyes were wide open in amazement -- at how our front yard was transformed in just one day! 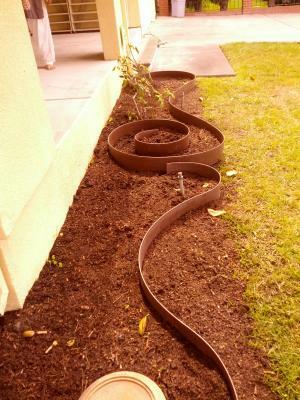 The weeds were cleared, organic soil and organic manure were mixed in from the back yard, and the straight line of the 18’’ adjoining wall of the balcony was transformed into a modern art without touching the sprinkers. The material that was used was already back in tool shed, leaving no trace behind. Olive tree that we had been gifted found a perfect spot, and the leaves were already dancing with joy. And now, the space was ready for edible flowers that I have been dreaming of planting for a long time. It all happened because of Joserra -- who we had the privilege of hosting with us for a few days. What a generous heart he is. In informal conversations with Joserra, I had learned how he was gardening in the slums of India as a way of service. For almost three months, he picked up plastic again and again, everyday, on lands that were used as trash. In the process, he built friendships and in subsequent months, he transformed that land into a vegetable garden and taught the slum residents and local municipal school children to care for it. I can easily imagine what that must've felt like, because that's what I felt myself today. Oh Harshidabeeeeeeeen!!! Thank you for your sweet words!! Just today I recieved a video of gratitude from some of the friends who are enjoying the awakin space in Burgos, place in the world we call spain. I will keep those 2 days with you and dear Dinesh in my heart and hope to keep enjoying forward the love you plant every Wednesday and beyond.